Whyyyyy are cherries so good. As you can tell, I’m in the phase of summer where I want to put cherries in everything. Loving it? Hating it? Is there anyone who does NOT like cherries? I’m curious. Are you a cherry hater? If so, omgthankyousomuch for being here. And please tell me why you hate cherries. I have wanted to make a smoky cherry salsa for years. Every summer when we vacation in Michigan, I always ramble on about buying everything at American Spoon. And yes. That may be true. But what I fail to mention is that Eddie and I also do some damage at Cherry Republic, which I don’t think is super new, but now has a closer retail store to where we visit. Cherry everything. Seriously. Cherries and chocolate, cherries and wine, cherries and trail mix, cherries and mustard (!!!!) – and samples of everything too. I don’t want to say I go there for a lunch of samples because that would be trashy but ummmm. I don’t know who would do such a thing. They have awesome cherry salsa. We love it. We buy a few jars and they are always gone by Christmas. My favorite is their original version because it’s kind of sweet. But! I really wanted to make a summery, tastes-like-the-grill cherry salsa. It’s no secret that fruit salsa recipes have made up, like, 67% of my blog recipes. They are always freshly chopped, include what’s in season and lots of sweet onion, cilantro, sometimes tomatoes, sometimes heat, lots of lime – you know. Lately I have REALLY been into restaurant style salsas, like the kind that is almost totally pureed. Know what I’m saying? I made one of those for a cooking class that I taught right after having Max and we’ve been loving on it ever since. This is a version of that. Of course, feel free to chop everything coarsely by hand if you’d like. I really enjoy both versions and the best thing is that this can go.on.everything. Last night I had it on the fajitas we can’t stop making. 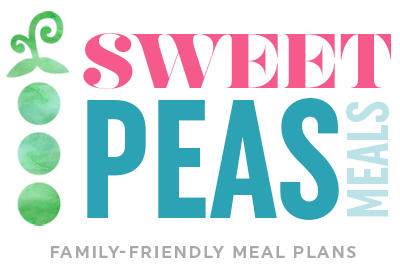 It is fantastic on fish, fish tacos, scallops, shrimp or even sweet potatoes. It’s delicious with tortilla chips or pita chips! You control the heat, the sweetness, and if you don’t really WANT the smokiness, then just chop everything up raw. I have never been one of those people that could eat salsa, especially restaurant style, by the spoon. The onions and garlic just get me. But this. I was seriously eating it with a spoon. Oh! And I put it on eggs too. Which sounds weird, since it’s semi-sweet, but I promise it’s the bomb. And I will never, ever, ever say that again. So you KNOW it’s good. Rub the onions and peppers with the olive oil, saving 1 tablespoon or so for the cherry. Place the onions and peppers on the grill. Grill until they begin to char (and the pepper skins bubble and blacken), about 2 to 3 minutes, turning often. Remove the onions and peppers and let them cool slightly. Once cool, I like to cut the onions into a few pieces. Then I slice the tops off of the jalapenos and slice them in half. I remove ALL the seeds except for 1 half. You can leave the seeds if you like – it will be super spicy! Remove them all if you’d like it milder. Place the pitted cherries on a grill tray or basket (we have one like this) – you can throw the garlic cloves in there too! Toss with the remaining olive oil. Grill until the cherries start to burst slightly and bubble and blister, just 2 to 3 minutes, tossing with a large spoon. Add the can of tomatoes, the onions, peppers, garlic, lime juice and almost all of the cherries (I like to save a few to add whole cherries on top – you don’t need to do this!) to a food processor. Pulse until you have the consistency of salsa you enjoy. I like this particular one to be restaurant style-like! Stir in the chopped cilantro. Taste and season with salt and pepper if desired. Serve and garnish with extra lime if you’d like. This can be stored in the fridge in a sealed container and stay fresh for a few days! give me all the chips! This looks INCREDIBLE!!! Cherries are the best and I totally go on a cherry overload when it’s cherry season. Give me all the cherries!!! Cherries are one of summers best presents! This salsa would be so good on a grilled cheese with some sharp cheddar or creamy brie, mmmm! Shut the front door! This salsa is the most epic thing ever! I am so not a cherry hater. Cherry salsa is amazing. Coming from Michigan, you are not allowed to hate cherries! I am not a huge cherry fan but this looks delicious. This is amazing – I am so obsessed with cherries this time of year! This salsa is such a creative use for them – I love it! I JUST finished all of my cherries yesterday :( This looks so good! I guess it might be an excuse to buy more? I’m definitely a fellow cherry lover. I cannot get enough. I’m shoving them into almost everything I make right now! This salsa is GENIUS!! I cannot wait to try it! My friend and I were lounging by her pool last Friday and we had a bag of cherries to snack on…I think I, seriously, ate the entire bag! Um, there is NOTHING wrong with making a meal out of “samples” at Cherry Republic. I ran the Bayshore Marathon in Traverse City in May, and we visited the store that evening…and I definitely had appetizers, and then returned for pre-lunch the next day! Yum! I love cherries so much! They are my favorite fruit! I am even considering getting a cherry tattoo when I go to the Michigan Cherry Festival this July 4th! Totally saving and sharing this recipe! Wait, there are people in this world that don’t like cherries?!?! That can’t possibly be true. And if there are, I bet they’d hate puppies and rainbows and babies, too. 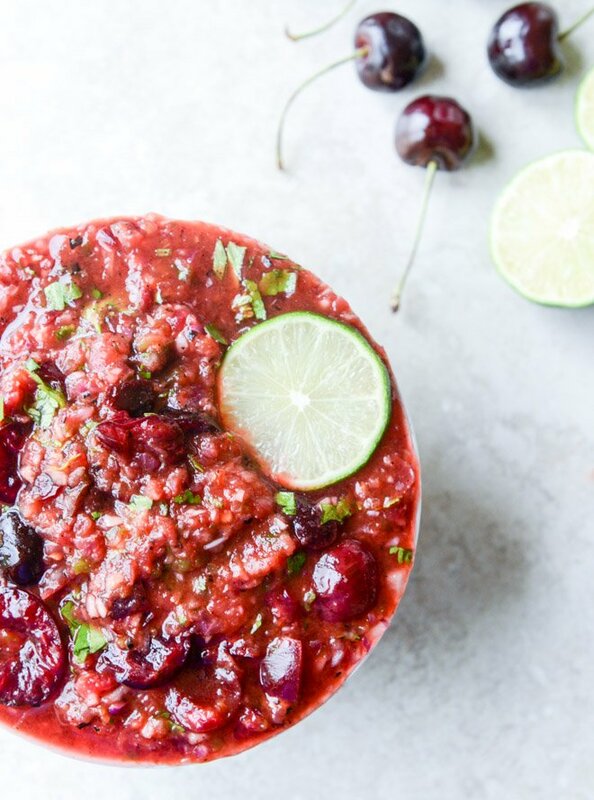 This cherry salsa looks FREAKING INCREDIBLE! And the egg idea? I’m so sold. Can’t waiiiit to try this one! This looks amazing! Do you think fresh tomatoes would work? I made it tonight with fresh cherry tomatoes that I just threw on the grill with the cherries and it turned out great. I just couldn’t do the canned tomatoes when I have a ton of fresh ones right now. 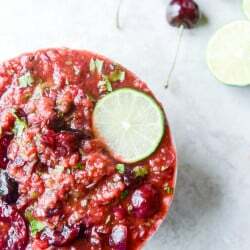 I’m not sure I could pick out the cherry flavor if I didn’t know what was in it, but it is a good fruity salsa recipe. Reminds me of a cranberry salsa I’ve made in the past without having to add any sugar. I am definitely not a cherry hater, I am cherry LOVER, sometimes I have myself for loving them so much, so so so much, that I spend way too much money at Whole Foods on them. Thanks God, BJ started caring organic cherry containers, and I get my fix from them. I remember when I used to live back home (Moldova) I used to go for summer vacations as my grandparents all the time, for 3 months, they have a big orchard with many cherry trees, apricots and any berries that you want, OMG that was heaven. I visited them this May, but it was too early for cherry season. Having that full access to the freshest and most aromatic fruits was amazing, I must make time and take a leave from work for a whole summer and just it there. Also, I have never heard of Cherry Republic, but thank you very much for sharing that gem, I must check if they have an online store. Good to know I’m not the only omgobsessedwithcherries cherry lover in this world. The best. uhm cherries are amazing. I celebrate at the beginning of cherry season and mourn at the end. This salsa looks so great! This will be a perfect addition to my summer ritual of finding out just how many foods I can put cherries on. I’ve never been able to get enough of them. My family owns a produce business in NJ and my grandmother lived next door to the warehouse. Growing up my cousin and I would go get bags of cherries and strawberries from the warehouse, then sit on her porch and eat them until we were stained red and sick to our stomachs. Then we’d do it all again the next day. I’m now 36 and still hoarding cherries like they’re gold. Omg you put cherries in salsa!!! I love cherries with a furious passion, except cherry flavoring (which is disgusting) and those bright marinated cherries in the jar (I think they’re called maraschino cherries, aren’t they?) but those taste absolutely horrible -so so so artificial. But since this doesn’t use either of them, I think I will take ALL of it and eat it with a spoon. Your pictures are stunning! I don’t know how you made this look so good, since salsa is usually just mush and this has a lot of red in it. So, basically, I don’t know how you made delicious red mush look so good (no offense, i promise). I loooove cherries but most people I know don’t like them or are indifferent so I can never really cook/bake with them. Okay, I could never have even imagine cherry salsa. But now I’m wondering where it’s been all my life? I cannot wait to make this! I never liked cherries until recently. I could never get the bad, horrifying taste and look of maraschino cherries out of my mind. (It’s probably weird that I don’t like those either!) BUT now, we are becoming very good friends. We are on a cherry binge! Casper has been loving them, too, which makes me incredibly happy. I have2 cherry recipes in the queue that I’m way excited about. I’m totally going to make this, soon! We just got a giant bag of fresh cherries and I know exactly what I’m going to do with them now!! I admit I hate cherries, even candy or soda that has cherry flavor turns my stomach, but I have a good excuse! As a pre-teen/teen, my great-uncle had an orchard and he’d hire me to pick them every season. Having absolutely no self control, I’d eat almost as many as I’d place in the bucket, prompting serious tummy-trouble and many (many, many) mad dashes through the trees to find an outhouse. Lesson learned but years later my body still rejects even the thought of them crossing my lips. 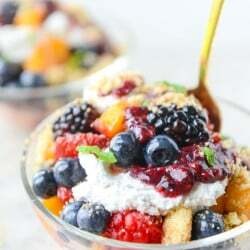 That said, I’d totally make this recipe with strawberries instead! I can’t wait to make this. It’s so creative and the photos are incredible. I was wondering if this could be canned. I’d love to know what you think. Thanks. Sounds amazing! We get Flathead Cherries here in late summer and I’m always looking for new ways to use them. Do you think this could be canned? This would be a great holiday/winter treat when the summer days are a distant memory in Montana. Cherry salsa is the bomb! We are now growing Balaton tart cherries(Hungarian variety) and make over the top salsa with them. Next time you are up north they are a must try, I think you will love them. They make the very best jam too. They are at least 10X better than Montmorency tart cherries and the flesh of Balatons is so gorgeous & you will be amazed by their sweet/tart flavor. This is just what I needed. I just went to a U-Pick Organic Cherry Farm in Oregon and I have 2 pounds of Ranier Cherries and 5 pounds of Bing Cherries. Wanted something savory with the cherries and this will be PERFECT!! !